The Cowboy Cottage is located about 6 miles from the Plaza in the beautiful village of Tesuque. Tucked away in the hills near the Santa Fe Opera, it is a truly unique and charming property which features two other available guest houses, a converted barn with yoga studio and massage space, and small chapel. If you have a larger group and are interested in renting our other spaces concurrently, please feel free to contact us. What would an old ranch be without a place for the cowboys? This cottage has a studio layout and is the perfect size for one guest or a couple. Tucked back behind our other guest houses, the Cowboy Cottage has two outdoor spaces. The first one you will find located right in front of the entrance with just enough shade to keep you cool during the warmer months. Through the front door is a sweet built in window seat with table. A small seating area sits beside it and leads to the adorable kitchen. With all the essentials but on a slightly smaller scale, you should be able to whip up simpler meals in between your jaunts into town. The bathroom is on the smaller side and it should be noted that it might not be the most comfortable fit for anyone over 6 feet tall. Please inquire with us if you would like information about our other guest spaces if this is the case. The bedroom is located off the living space and is a large open area with built in banco, desk, closets and the queen-sized bed. Two french doors open out to the covered porch which faces the large lawn and private chapel. There is plenty of outdoor space to enjoy located around the property. Just a quick walk up a path and you'll arrive at the large lawn which surrounds a small private chapel. Settle in under the large apricot tree or relax on the hammock nearby. Located at the entrance of the property is a converted barn which features a yoga studio, massage table, steam shower with bathroom (additional fees are charged for use of this space). The large porch extends the length of the barn and is a perfect area to sit with a larger group for board games or small gatherings. Across the driveway are our resident alpacas who will look on with curiosity as you are traveling around the property. The property is also home to chickens and ducks and our on-site caretakers, Jeff and Lauren. 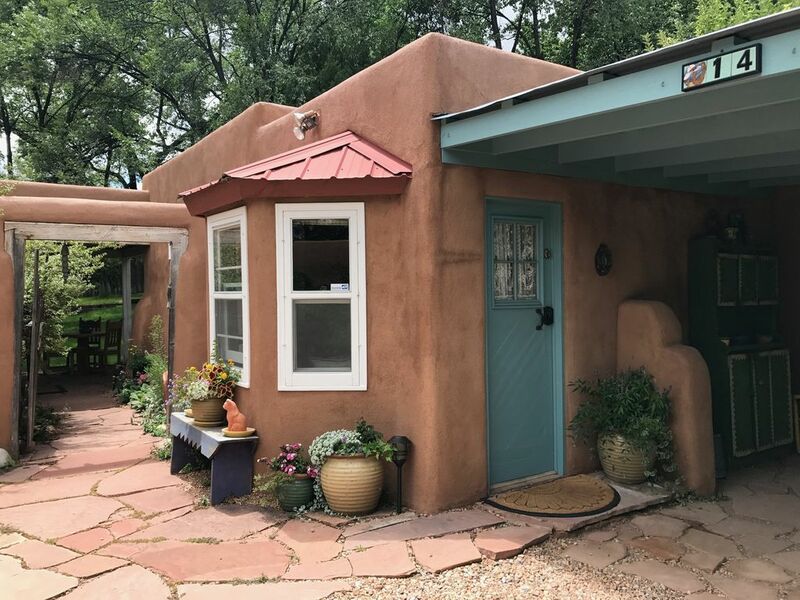 The Cowboy Cottage is on a charming estate in Tesuque, New Mexico available for vacation rentals with sweeping views of the Sangre de Cristo Mountains. With three distinct guest houses, the property can sleep a total of 12 and includes private amenities such as a yoga studio, massage room with steam shower (available for an extra fee) and small chapel. Please see our additional listings for information on the other guest houses available on this property. More interesting than any hotel room, The Cowboy was a charming, cozy and protected accommodation in the architectural tradition of Northern New Mexico. The decor was a virtual museum! I spent my first hour strolling about the cottage, admiring the collection of artifacts and books. The additional benefit is the marvelous gift of a stay in the lovely village of Tesuque. I look forward to my next visit to the property! Those in need of a getaway will be very happy in this quaint little place. For hanging out - In the summer months, 2 portals to choose from, in the winter a cozy kiva fireplace one can view from the bed. While small, and I would say ideal for a single person, the amenities are all there. If you are a cook, I would choose one of the other houses on the property. Lauren the absolutely lovely and helpful caretaker (along with her husband) showed me the other houses and they are much bigger with a fuller kitchen and also seem really cozy. But if you are there for a quick few days like we were, Cowboy Cottage was perfect. The little chapel is so sweet and the alpacas are fun to meet. The El Nido restaurant had great food and the Tesuque Village Market has you covered. We enjoyed our stay in this cozy little casita, just perfect for a couple. Lots of little special touches & great ambience. It has everything you need - even an essential oil diffuser, which I thought was a nice extra since I always travel with one. Not only is the casita nice, but the grounds are beautiful. We spent most of our time outside enjoying the area. We did our daily devotion in the quaint & beautiful little chapel out back. A very nice place for relaxation & enjoying nature. The only slight negative would be the small bathroom, but it was not an issue for us. We would definitely consider staying here again. While the cottage was wonderful, better than we expected, it was nothing compared to the grounds. This place is absolutely amazing. The attention to detail was evident in everything we saw. Well set-up, thoughtfully decorated and equipped cottage, beautiful outdoor space with gardens and landscaping. Right-priced and convenient to Santa Fe Opera. Clean and tidy space. Tierra Alegre CANCELLATION POLICY Full price of reservation due at the time of booking. Full refund will be issued if cancelled 14 days prior to the first day of reservation, minus $20 booking fee. 50% refund will be issued if cancelled 7 days prior to the first day of the reservation, minus $20 booking fee. We will not refund a reservation if cancelled less than 7 days prior to the first day of reservation. If we are able to rebook for some/all of the days of the reservation, there will be a full refund issued for the re-booked dates, minus $20 booking fee. Please contact us directly with additional questions.